There are some stories that get written once a year, over and over again. In Maine, the king of all once-a-year stories was Andre the Seal. Maine reporters cringed every year when Andre, a harbor seal that had been abandoned as a baby by his mother, would return to Rockport Harbor. I must have written this story at least a half-dozen times. This was the 1976 version. ROCKPORT, Maine (UPI) – When the sky lightened over a foggy Rockport Harbor Monday, Andre was there. Andre, a fat 16-year-old harbor seal, had spent most of the past two weeks lounging in a series of rowboats from Port Clyde to Cape Rosier. His trainer, Harry Goodridge, Rockport’s harbormaster, was beginning to think that Andre had decided to stay free. Goodridge found Andre when he was a small pup, not long after the seal had been abandoned by his mother. Goodridge kept the little seal in his bathtub for a while, and later built him a pen in the harbor. 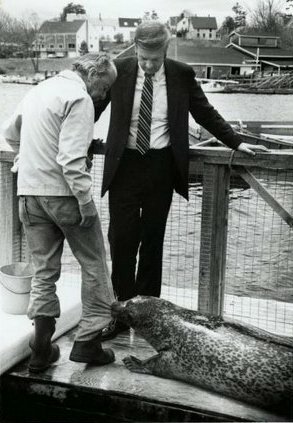 Andre learned tricks, and the seal and his trainer have been entertaining visitors to Rockport since the early 1960s. In the winter, Andre would swim south, and spent some time in the harbor in Marblehead, Mass. But the past three years Goodridge has taken Andrew to the New England Aquarium in Boston for the winter. In the spring, Andre has been taken to Marblehead and set free. A few days later, he shows up in Rockport. Andre usually makes the swim in three or four days. But this year was different. Andre visited some people along the coast and played games with boaters before arriving in Port Clyde, a few miles south of Rockport. He climbed into a rowboat, moored 200 feet offshore, and went to sleep. Andre stayed in the boat for two days, sleeping and sunning himself. A local resident said the seal would occasionally scoop up a flipperful of water from the bottom of the boat and lazily splash himself. His next visit was at Deer Isle, about 20 miles east of Rockport. He spent some time in a rowboat there, and then was spotted in a boat in Cape Rozier. But two boys were at Goodridge’s house early Monday. Goodridge said Andre looked good, and said he had lost some of the weight he had gained over the winter at the aquarium. When Andre spent his winters free, he would sometimes take off for extended periods. While Goodridge and his wife worry about Andre when he’s gone, they both have hoped that the seal would one day leave Rockport Harbor and learn to live on his own.